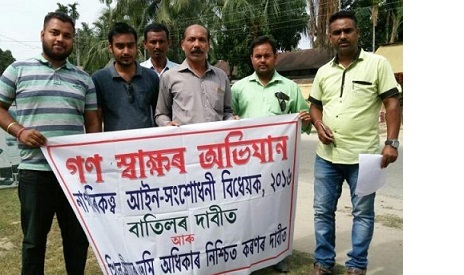 Along with other parts of the State, different organisations in Udalguri, which have also been fighting for protection of rights of the indigenous people, have registered their opposition to the proposed Citizenship (Amendment) Bill 2016. Prabajan Virodhi Manch started a mass signature campaign at Udalguri from Saturday. The Citizenship (Amendment) Bill 2016 seeks to grant Indian citizenship to illegal migrants who are Hindus, Sikhs, Buddhists, Jains, Parsis and Christians, who came from Afghanistan, Bangladesh and Pakistan to the country till December 31, 2014. The litterateurs, senior citizens, artistes, journalists and other people of Udalguri also came out opposing the Citizenship (Amendment) Bill 2016 which violates the spirit of secularism as enshrined in the Indian Constitution by distinguishing illegal immigrants on the basis of religion. The Prabajan Virodhi Manch demanded that the proposed Bill if passed will be a threat to the existence of the ethnic communities in the State as it would facilitate Indian citizenship to Hindu Bangaldeshi migrants and it would be tough to protect the socio-political rights of indigenous communities. “The proposed Bill will destroy or exterminate the indigenous ST, SC and other ethnic communities of Assam and reduce the indigenous people of the State into minorities,” said senior journalist Akhil Kalita. The activists of Asom Jatiyatabadi Yuva Chatra Parishad (AJYCP) and Asomiya Yuva Manch (AYM) also joined mass signature campaign. The signatures would be sent to the Prime Minister’s Office through the Deputy Commissioner, Udalguri.